Who doesn't love a salmon recipe with minimal effort and maximum flavor? Combine olive oil, lemon juice, green onions, parsley, rosemary, thyme, salt, black pepper, and garlic powder in a small bowl. Set aside 1/4 cup of the marinade. Place salmon in a shallow dish and pour the remaining marinade over the top. Cover and refrigerate for 30 minutes. Remove the salmon and discard the used marinade. 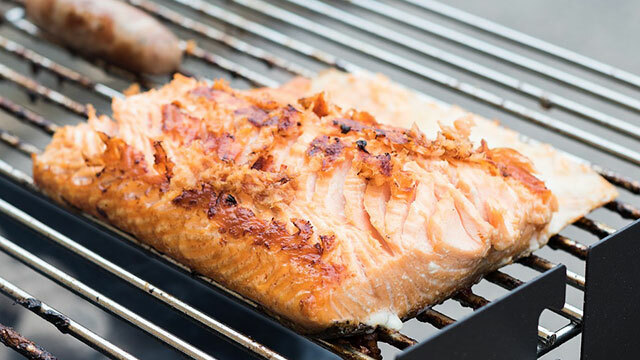 Place salmon on the preheated grill skin side down. Cook, basting occasionally with the reserved marinade, until the fish flakes easily with a fork, 15 to 20 minutes.